I had no clue--none--that Nova Scotia had a werewolf legend. This is why I appreciate Steve Vernon's work: he has an innate ability to dig up these folkloric gems and relay them through written word as if his audience is sitting round a campfire.This book isn't just about a werewolf, though a novel about a Maritime lycanthrope would have been welcome. It's a collection of over twenty legends and local myths that lay scatted across this humble province's rocky shores. This is actually old hat for Steve with other collections already under his belt including Haunted Harbours, Wicked Woods, Halifax Haunts, and Maritime Monsters.The stories stretch from the northern inlets of Cape Breton to the southern shores of Yarmouth. And, as a Nova Scotian, it's always a treat to stumble across a tale that reference not only a place you know, but a place that's walking distance. The stories also demonstrate the vibrant imaginations and superstitions that provide the roots for these local legends. Every region has their fair share, especially in history-rich rural sections of the landscape.Three of my favorites from this collection would have to be: "Murder Island Massacre," a story of thousands of skeletons beached on Murder Island, with connections to my own hometown and a beguiling woman who may have played a darker role in the fates of those who died; "The Quit Devil," a coal miner’s deal with the Devil and a legacy left to his son; and "The Capstick Bigfoot," about a fabled beast roaming the Cape Breton wilderness and doing good deeds.The stories are brief and to the point, at times begging for a broader canvas on which to be painted, allowing readers to whisk through a couple tales at a time on coffee breaks, or wading through the entire book in a couple of evenings. Any Canadian should read at least one of Steve's collections, and as far as the rest of the world is concerned these stories are a fantastic inroad to the culture and kookiness--and sincerity--in my region of the world. Not something I would normally read. I think this is my first collection of short stories based on Folklore, and I actually enjoyed it. I like Steve Vernon's writing, and the idea that this collection was put together based on what local's believe in and pass down through generations is fascinating.Very slow paced, which is nice for a change, and I found many of the stories interesting and emotional. I've spent a fair amount of time in the Maritimes, but I was young and wasn't interested in the local culture, after having read this I wouldn't mind going back and absorbing something other than alcohol and good food. I love a good ghost story, and The Lunenburg Werewolf: And Other Stories of the Supernatural by Steve Vernon is full of exceptionally good ghost stories, plus fabulous tales of monsters, pirate gold, fairy folk, demons and devils. It’s positively oozing those “creepy tales to tell around the campfire” and the “keep the lights on while you read” scary moments, yet it still maintains a black and whimsical sense of humour.The book is darkly delightful. My fellow Nova Scotian, Steve Vernon, has collected an odd assortment of horrific tales, from the far corners of our fair province of Nova Scotia, and woven them into a first-rate and entertaining book of folklore. Between the covers you will find the ghostly Lady in Blue, the Phantom Ship of the Northumberland (my favourite ghost story), a Phantom Artist, a Black Cat that lingered after death, Beasts, Selkies, and of course the aforementioned Lunenburg Werewolf.The author knows how to spin a satisfying yarn, weaving fact, history and folklore into a compelling read. Be the tales truth, fiction or a little bit of both, The Lunenburg Werewolf may leave you believing in ghosts. Or at least loving their stories. I can give The Lunenburg Werewolf: And Other Stories of the Supernatural a high recommendation; just be sure to leave all the lights on when you read it. 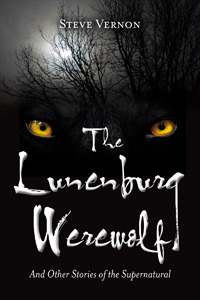 The Lunenburg Werewolf is a collection of supernatural tales from Nova Scotia, a Canadian province rich in folklore. Not only is there a werewolf, but a Bigfoot-like creature, Selkies, and lots and lots of ghosts. Author Steve Vernon not only tells these tales with all the verve and enthusiasm of a born storyteller but he also gives their background, the stories behind the stories if you will. These tales range from very sad to laugh-out-loud funny; some are clearly based on true happenings but with a little of the supernatural thrown in to enhance the stories; some are based on old tales brought over by the original French and Irish settlers including one or two Acadian; and some, like the last one in the book, are written, I suspect, just for this anthology.If you are looking for tales of horror, this is not for you. However, if you enjoy fairy tales, myths and folklore with a little 'reality' thrown in, this might just be the perfect fix for that dark and stormy night. But, beware, at the end you might just find you have an almost irresistible urge to visit Nova Scotia to do a little treasure or ghost hunting. Whenever my husband and I travel to new places, we always try to a) find a local ghost walk to take because it’s a great way to find out about a city’s history and b) pick up at least one locally written book of local ghost stories. Such is Steve Vernon’s "The Lunenburg Werewolf and Other Stories of the Supernatural," covering Nova Scotia, Canada, and a lovely volume it is. There are tales well-known (“The Ghosts of Oak Island,” detailing the search for a long and much-rumoured buried pirate treasure) and those not well-known but specific to location (most of the rest of the stories in the book). Vernon is a good story-teller, you can tell his oral retellings are excellent by the cadences of the written forms, and all of these are fun. I like that he includes versions of tales from the Mi’kmaq as well as those of European settlers. I especially liked the last story in the book, “Liam and the Lutin,” which brings together all the other characters in all the other stories in a quite wonderful way. Fans of this type of work, amongst whom I include myself, will enjoy this; visitors to - and residents of - Nova Scotia will get a kick out of it too; recommended! I really enjoyed this book. I liked the author's style of writing and the actual stories, and I loved the Canadian content. My only complaint about the book is that the stories are not long enough. Each story in this book is like a little teaser. You learn just enough about the origins of each story but none of them go into great detail. Most are only a few pages long. I would have preferred less stories with more "meat on their bones". Some of the stories made me want to learn more about the original legends, and perhaps I will. This book is worth reading, just keep in mind that the stories are like introductions and you may be left wanting more. Still, it is a great collection of Canadian lore and a good introduction to the subject. I knew that Canada is full of different kinds of folklore but I didn't know about the werewolf legends in the East. I love reading books by Canadian authors. I highly recommend this book.I won this free book from GoodReads. Perfect collection to read on a plane to or from the Atlantic. Or...anywhere, really. An interesting collection though laid out a bit oddly.